As the holiday season approaches, what better way to spread Christmas Cheer than being the “army” for a child in need and giving the gift of Christmas. Presents may just be objects to us. 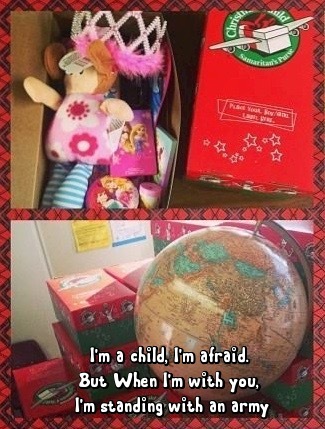 The Operation Christmas Child project may just seem like a bunch of shoeboxes with items from the dollar tree; but to a child it sends a message that in pain, fear, and loneliness- you are not alone. There is always someone who cares. These gifts demonstrate to the children that receive them that they are not alone. That they have an army, somewhere, half-way across the globe: someone cares. And aren’t we all like children? In pain. Young. afraid. Aren’t we grateful for the times when someone has taken our hand, given us a present, reminded us of their presence and said: “I’m with you, let’s face this together.” One simple shoebox can speak such a loud message to someone in need. And while you’re at it, tell someone right next to you who needs to hear that you are here for them. That they don’t have to stand alone, they are not on the front lines of battle without armor, without an army fighting the fear together, hand in hand, heart in heart. That is the only way we can win this war: with Love. There’s a quote that the legendary John Lennon is credited for saying: “Life is what happens when you’re busy making other plans.” I know that is supposed to be an inspirational quote, but frankly, it freaks me out. You see, I’m a planner. And what that means is, my brain is always running, running, running. I’m constantly flooded with ideas and dreams and hopes and plans; which are all good things. They are things that excite me, make me look forward to waking up in the morning. but can sometimes make me believe the illusion that my life is completely in my control. That if I just the right amount of sticky notes, or buy that one more daily/monthly/yearly planner that this organized, strategic planning will lead me to the highest amount of success and happiness possible. But this lesson did teach me something. It taught me that I can’t find my life in the grasping and clinging to the idea that I have for what I want life to be. I also can’t sulk and give up simply because what I wanted (or thought I wanted to happen) didn’t happen, or not yet. And while I love planning, and I feel like that creative, excited, dreamer part of me is a part that God created; I must hold my idea of my life loosely. Of a “perfect life” loosely. Because even if everything did turn out the way that I had hoped, the experience and living of it would not be all that I hoped for or thought it would be. The reality is that God knows the outcome of my plans better than I do. The thing I thought was best for me, may not actually be best for me. 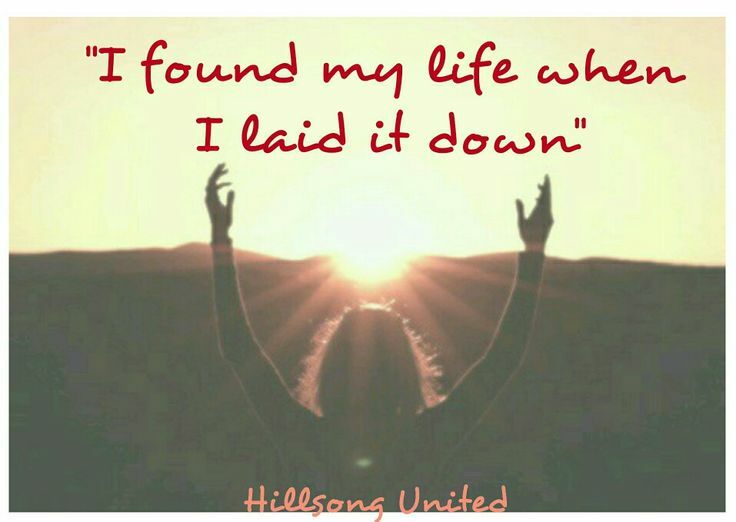 And the life that I find when I let go of the life I keep trying to hold onto is the abundant life that is promised to me.